StageBuzz.com: Interview with Nabil Vinas of "Goliath"
Nabil Vinas is a first generation Dominican American, a graduate of CCNY, and co-founder of The Seven Collective Theatre Company. He is currently developing several film projects, and will be appearing in the feature "Things I Don't Understand" by David Spaltro. He opens in Goliath tomorrow night at the Poetic License Festival. Tell me a little bit about Goliath. 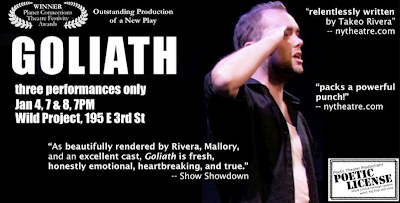 Goliath is a choreopoem written by Takeo Rivera. It's creative storytelling in a form similar to For Colored Girls... by Ntozake Shange. Based on true events, it revolves around a soldier coming to terms with his actions in Iraq. What drew you to be part of this play? Well, I saw this character David as honestly trying to face some very ugly truths. And since these truths are drawn from actual events, I thought it presented an opportunity for everyone in the room, audience and performer, to face them honestly as well. I found that potential to be pretty interesting. And in reading about Poetic Theater I got the sense they'd be an inspiring team to work with. So yeah, I was definitely drawn. Tell me a little bit about the production. Who else is part of your team? 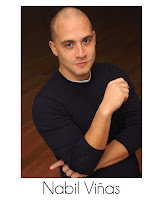 We have a wonderful director in Alex Mallory, who won "Outstanding Director" at Planet Connections Theater Festival this year. The talented returning cast that won "Outstanding Ensemble" (Samantha Cooper, Dontonio Demarco, Natalia Duong, Edgar Eguia and Monique Paige). And we have two new artists in Kenneth Heaton and myself, whom the team has so graciously embraced. Everyone has their own unique energies and voices. And they all work nicely to color the story and tell it together. As you mention, Goliath was previously part of the Planet Connections Theatre Festival. Are there many changes from that production? My understanding is that there won't be very many. Alex has been open to exploring staging and the new space. There are two new faces so you can expect changes in that sense. And I imagine it possibly landing differently today with our troops finally home from Iraq. But the production in general shouldn't feel like too much of a departure. If you could say one thing to your potential audience about the show, what would it be? I heard Daniel Radcliffe strips in it. But that might just be a rumor.